As part of the series on achievers from SJMSOM, IIT Bombay, we bring you the second instalment on winners of corporate competitions. Team Visionaries consisting of Daksh Gupta, Venkata Hareesh Kodi and Swetha Thomson won the prestigious Nestle Plan-o-Chain 2018. Here, we have Swetha Thomson writing about the team’s journey and the emotional roller coaster they went through in the run-up to the win. “I should have prepared more”. In the halls of Nestlé House, seated with a cup of coffee, thoughts kept rushing through my mind as I was waiting for the announcement of the results. I looked back at the set of events that had led me to that moment. “An essential part of MBA life is Corporate Interaction and participation in Corporate Competitions.” Seniors and most MBA graduates I met had told me that. I did not understand the true meaning of this until I entered SJMSOM. There were multiple opportunities to attempt developing strategies and structured thinking by participating in various competitions. Plan-o-Chain by Nestlé was a competition I was looking forward to taking part, owing to its renowned legacy. As soon as the competition was announced, we formed a team of three, called Visionaries and were eager to approach the case. The case was about the launch of a new product in the adult nutrition segment. The solution was to be provided along with the marketing plan, go-to-market strategy and entire supply chain design. The first round consisted of the submission of the presentation. We contacted several faculty members and they were of immense help for evaluation of various perspectives and directing us towards the most logical approach. Amidst a busy schedule of classes and other submissions, we took the time to make a presentation that reasonably represented our solution idea. I was delighted that my team’s presentation was among the top six from our campus to be selected. There was an additional requirement of the inclusion of the income statement and working capital for the Campus Round presentation. On the day of the Campus Round, we were the last team to present. There were judges from the Nestlé office evaluating the presentations. After rounds of rigorous practice, we presented our solution to the judges and were met with gruelling questions during and after the presentation. We tackled all the questions to the best of our knowledge and waited for the announcement of results. I was thrilled when the judges announced that our team had been declared the Campus Winners and had qualified for the national round. A total of three teams from three colleges had qualified for the National Round. In this round, the stakes were much higher. We worked hard on our presentation, unaware of the preparation levels of other teams. We focused on providing an end to end complete solution for the case so that all possibilities are factored in. The day before the National Round, we reached Gurgaon and stayed at the accommodation provided. We were anxious and eager to give our presentation. Our team was the second to be presenting, after the presentation by the team from NITIE. The presentation was 20 minutes long with an additional 10 minutes for questions. We elaborated on the marketing initiatives and strategies in the supply chain and were met with a round of intense questioning. We answered the questions to the best of our knowledge. My cup of coffee was almost empty as three presentations were completed, and we were waiting eagerly for the results. We were escorted to meet the Head of Human Resources, Mr. Amit Narain and other members from the management team of Nestlé. 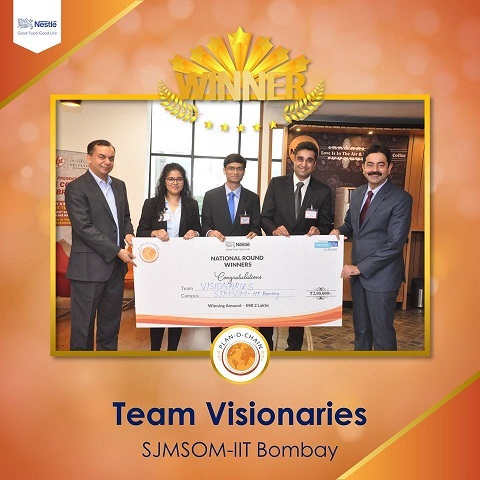 “And the National Winners are Team Visionaries from SJMSOM”, they announced. We were ecstatic as we rushed to receive the cheque and the certificates. Photographs clicked and greetings exchanged, we rejoiced thinking about the long hours and sleepless nights that we spent editing and improvising our presentation that had finally paid off. The entire experience provided me with numerous learning opportunities and introduced me to the process of analyzing multiple perspectives before deciding on the optimal solution.